People watch a TV news report about North Korea's hydrogen bomb test at a railway station in Seoul, South Korea, Sept. 3, 2017. North Korea conducted its sixth nuclear test Sunday, one it said successfully detonated a thermonuclear hydrogen bomb that can fit onto an intercontinental missile (ICBM). “The test of a hydrogen bomb designed to be mounted on our intercontinental ballistic missile was a perfect success,” said Korean Central Television newscaster Ri Chun Hee, who retired in 2012, but occasionally reappears for major events. Ri also claimed that no radiation from the nuclear detonation was released into the atmosphere, something U.S. and Japanese aircraft with special atmospheric monitoring equipment are attempting to verify. 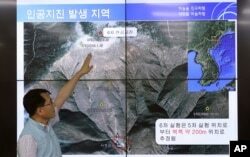 Earthquake and Volcano of the Korea Monitoring Division Director Ryoo Yong-gyu explains an artificial earthquake in North Korea, in Seoul, South Korea, Sept. 3, 2017. North Korean TV says the country has successfully tested a hydrogen bomb that is meant to fit into an ICBM. 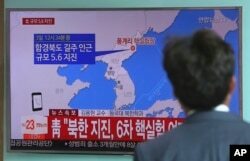 The blast produced two shallow earthquakes that were detected in the Punggye-ri region where North Korea’s nuclear test facility is located, according to U.S. and Chinese government seismologists. Authorities in Japan, South Korea and numerous nongovernment experts in the United States confirmed that the earthquakes were likely the result of a nuclear test. Five minutes later the same seismologists detected a magnitude 4.6 earthquake, which indicated the likely collapse of a tunnel in which the nuclear device was placed. “If North Korea has gone ahead with a nuclear test, this is absolutely not acceptable and we will have to strongly protest. We are starting National Security Council now to collect information and analyze this,” said Japanese Prime Minister Shinzo Abe. Jeffery Lewis, the East Asia program director at the James Martin Center for Nonproliferation Studies, said he is not surprised that North Korea has achieved the capability to test a full-scale thermonuclear weapon. 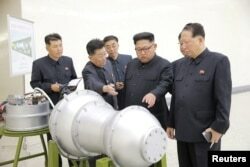 “Every country with five nuclear explosions was well on its way to thermonuclear weapons by the fifth test,” he added. Japan’s chief cabinet secretary has called for the United Nations to impose further economic sanctions to include restricting oil imports to North Korea. In July the Security Council unanimously imposed restrictions that included an export ban on fish, coal and other lucrative minerals that could deprive Pyongyang of more than $1 billion in revenue. The Tokyo Shimbun reported in its online edition Saturday that North Korea has decided to conserve oil and gasoline in anticipation of an oil embargo. The newspaper said that the North’s State Affairs Commission set a goal to store about 1 million tons of oil as a reserve. China’s Foreign Ministry Sunday issued a statement condemning Sunday’s nuclear test and urging North Korea to stop its “wrong” actions and to respect U.N. Security Council resolutions. South Korea on Sunday called for the “strongest possible” response, including new U.N. Security Council sanctions to “completely isolate” North Korea. Seoul and Washington also discussed deploying U.S. strategic military assets to the Korean Peninsula, Chung Eui-yong, South Korea’s national security adviser, said in a news briefing. The head of the International Atomic Energy Agency called the test an extremely regrettable act and a matter of grave concern. IAEA Director General Yukiya Amano said the new test is in complete disregard of the repeated demands of the international community. North Korean leader Kim Jong Un has prioritized developing a nuclear-tipped ICBM that could hit the mainland U.S. Sunday’s nuclear test was preceded by 21 missile launches this year, including two ICBM tests in July. The administration of U.S. President Donald Trump has repeatedly said that North Korea’s development of a long-range nuclear missile strike capability would constitute an unacceptable existential security threat. American officials have stressed the need to impose pressure through sanctions to force Pyongyang to change its behavior but have said that all options including military action are being considered. Trump and Japan's prime minister spoke by phone Saturday before the nuclear test, and stressed the need for close cooperation between their two countries and South Korea in the face of the growing nuclear threat from North Korea, according to a White House statement. The two leaders also agreed that pressure must be raised on North Korea, Abe told reporters. Both South Korean President Moon Jae-in and the Japanese prime minister convened their National Security Councils (NSC) Sunday shortly after the earthquakes were detected. The liberal South Korean leader has been frustrated by Pyongyang’s continued provocative behavior that has prevented him from pursuing a more engagement oriented approach to reduce tensions with the North through dialogue and cooperation. North Korea conducted its first nuclear test Oct. 9, 2006. VOA's Steve Herman reported from Washington, Brian Padden in Seoul.